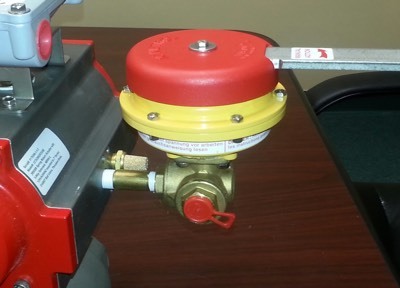 A Kinetrol USA Mid-Atlantic Distributor had to find a way to make it easy to incorporate manual failsafe units onto larger valves. Their solution was to take an existing spring return actuated valve in the plant, and retrofit it with a 3-way "L" port ball valve and a Kinetrol Manual Failsafe spring handle on the inlet air supply port. This allows the opening of the valve with the manual failsafe handle. When the handle is released, the valve shuts automatically by venting the air to atmosphere, and allowing the springs in the actuator to close the valve. Size limitations on the valves are no longer an issue and this will work on anyone's pneumatic spring return actuator.